new page with a list of software development projects. EMBRACE page: home menu item and link to paper. update about satorchi. I am now at APC. updated career history. I am now at APC! updated contact info. I am now at APC! lecture on radio astronomy, dark energy and dark matter at IUT Bourges. published on arXiv the final version of the proposal for MANTIS: The Mid-Frequency Aperture Array Transient and Intensity-Mapping System. added the proposal for MANTIS: The Mid-Frequency Aperture Array Transient and Intensity-Mapping System. published the SKA Aperture Array Mid Frequency Science Requirements. added a new introduction to SKA aperture array technology. added a full list of my publications with links to the PDF files. publication list also accessible from the SKA pages..
publication list also accessible from the Odin pages..
publication list also accessible from the Herschel/HIFI pages..
added a link to my ResearchGate profile on the main page. fixed broken link to Slackware subscription on the software acknowledgements page. updated link to the Nançay directory on the contact page. added a missing paper to the publications list: R&D at Nançay. added a link to my Project Scientist Manifesto in the SKADS intro page. added a Plea for the Advanced Instrumentation Program which was first sent as a letter in February 2012.
added my Project Scientist Manifesto which was submitted in May 2012.
updated the link to DEAP on the astronomy software page, but the DEAP project is definitely no longer being developped. updated my list of SKA presentations, from 2010 onwards, including 8 during the year 2011, and several more from the beginning of 2012.
added the beamformer paper to the list of publications. I published a popular article on EMBRACE at Nançay, January 2012.
article on international projects at Nançay, July 2011.
article on the balloon experiment for cosmic rays at Nançay, June 2011.
after an enormously long hiatus, finally here are some updates to my webpages! beginning with a bunch of appearances in various public media. added the feature article in the Berry Républicain newspaper, 18 May 2010. I was interviewed for a feature article in the Berry Républicain newspaper, 11 February 2011. 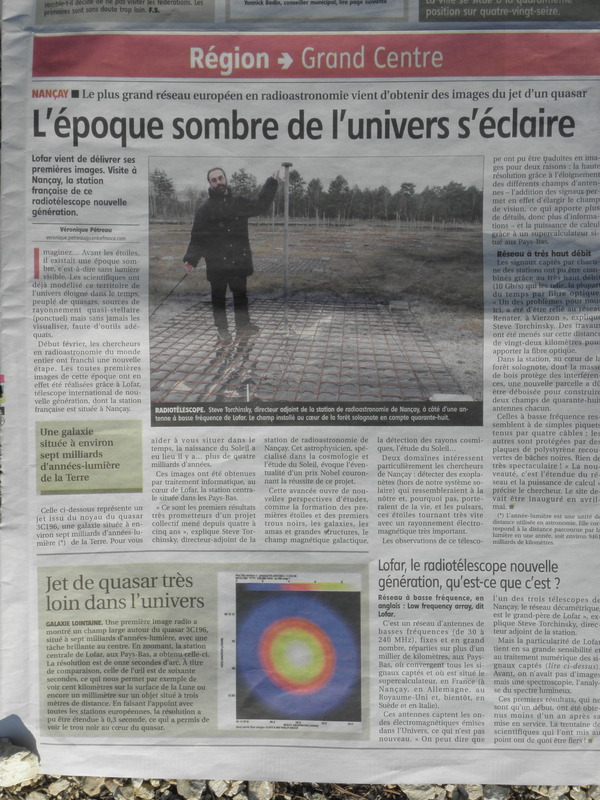 I was one of three guests on a special LOFAR television interview on France 3.
fixed link to Sun Kwok in the Odin Chronicles page. fixed broken links on the Chalmers page for Onsala and GARD. updated the SKADS introduction page with a comment about my role as Project Scientist. pictures of 56 tiles installed at EMBRACE@Nançay, 2010 August 17 and 31, including the return of Henrik Olofsson. removed my portrait and text from the front page, and it displays the four most recent changes. added a google map of Nançay. A look at fallen trees near EMBRACE at Nançay, a couple of months after the wind storm Xynthia. pictures of 33 EMBRACE tiles installed at Nançay, during a visit by Cyril Tasse et Ann Poncelet, 2010 April 21.
pictures of 25 EMBRACE tiles installed at Nançay, during a visit by Albert-Jan Boonstra, 2010 April 13-14.
picture of the Nançay Radioheliograph and CODALEMA, 2010 April 21.
new format for slide shows with improved navigator buttons, and a rolled-up side menu. reorganised old pictures of Nançay into sections on each of the instruments. views of the Nançay Decimetric Radio Telescope from above. views of the Nançay Radio Heliograph from above. résumé de carrière en français. as of 12 april 2010, I am an assistant director at Nançay. the new colours on the Nançay pages match the official Nançay website. pictures of EMBRACE modifications at Nançay, 2-3 March 2010.
pictures of the Focal Array for Nançay project, 3 March 2010.
pictures of the Nançay Radio Heliograph, 11 February 2010.
overview photo of Nançay in the snow, 11 February 2010.
photos of Snow on LOFAR at Nançay, 11 Feb 2010, during the visit by Henrik Olofsson. photos of LOFAR at Nançay, 1 March 2010, during the LOFAR Super Station meeting. photos of 16 EMBRACE tiles at Nançay., during the visit by Henrik Olofsson. listed three new SKADS publications which appear in Proceedings of Wide Field Science & Technology for the SKA, and the whole proceedings, edited by S.A. Torchinsky et al. are available for downloads. updated contact information, now that SKADS is finished. Scilab added to the list of radio astronomy software. MeqTrees added to the list of radio astronomy software. astLib added to the list of radio astronomy software. Mathematica added to the list of radio astronomy software. the ADASS conference series added to the list of radio astronomy software. The new EMBRACE radome at Nançay. updated link to Free Software Foundation. photos of EMBRACE at Nancay. updated link to Kevin Volk on the Odin pages. updated link to Sun Kwok on the Odin pages. added my spectral line FITS extractor: fitsplode. added fitsplode on the list of spectral line software. added SPLAT on the list of spectral line software. removed old pictures of from the photo album. added pictures of the EMBRACE radome and platform taken on 11 December 2008.
added pictures of the Dwingeloo 25m radio telescope. added pictures from the SKADS workshop in Lisbon 2-3 October 2008.
added the SKADS Newsletter #4, published in November 2008.
added pictures during observing at the Effelsberg 100m Radio Telescope with Henrik Olofsson on 1-3 September 2008.
added a note that my picture of EMBRACE was the ASTRON/JIVE daily image for 16 September 2008.
added a link to Myke in the caption of the kite-flying picture. pictures of EMBRACE under test at ASTRON, 21 August 2008.
my submission regarding Mechanical Engineering and Astronomy. added a section with a list of web submissions on the popular media page. added a comment that the DEAP software project seems to be dead. added ASAP on the list of data reduction software. added GNU Octave on the list of data reduction software. added a link to Sun Kwok’s article on Protoplanetary Nebula at Scholarpedia. Here are variations on my name so that search engines will find me with common misspellings of my name. photos from a visit to Dwingeloo, 7-8 May, 2008 where we saw the EMBRACE Prototype tile outside taking measurements of the sun. cosmetic changes, and changes to error handling. The error handler attempts to find the page you really wanted, if you were using an outdated link. added the URSI paper on SKADS in the SKADS publications page. description of the Odin calibration optics, including the infamous erroneous sky beam directions. The introductory text has been updated to note that Odin operations stopped at the end of December 2007, because we ran out of money. also added to the Radio Astronomy section. and also to the ROE alumni page. correction in the career history section. The SKADS contract runs to the end of June 2009 (not July). added acknowledgement to Cascading Style Sheets in the software acknowledgement page. added a quicklink drop down menu. updated the media appearances page with the article in Dossier pour la science and the public talk given at Goutelas. expanded the career history pages. various tweaks to the message web form which is under attack by spam robots. cosmetic changes: buttons on slide show navigator, and fixed the thumbnail page which didn‘t display properly in MSIE (doesn‘t understand the CSS border-spacing directive). added PHP and Apache to the software acknowledgements. fixed a broken link in the Quasi-Optics page. reduced the number of photos of the ALFA installation and day after installation. added link to changelog in last-update info at the bottom of each page. menu and style in changelog follows the referring page (same as contact info). last update 2016 June 26, 02:52 UTC by Steve Torchinsky. See changelog.